Strong Camel presents this brand new 10' x 10' Pop-Up Canopy Tent. 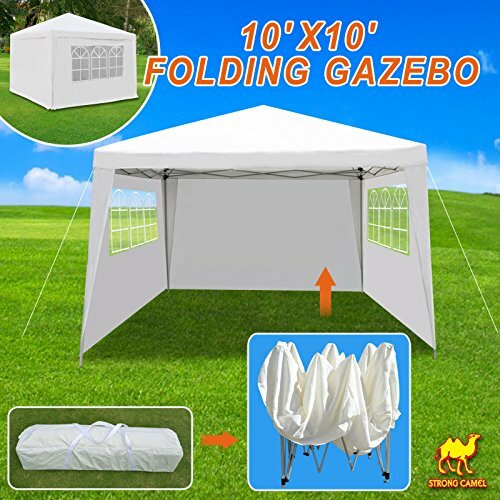 This spacious canopy tent is made from powder coated steel (rust/corrosion resistant) and a waterproof polyethylene fabric, it is the perfect pop up tent for the beach, backyard or even flea market stall. Sturdy steel pole frame with silver powder coating.Made of Water proof polyethylene cover. Blocks up to 95% of the suns UV Rays.Ideal for recreational, party, BBQ, cater events, and commercial use. GG GROUND GRABBA HexHook Pro 12 Pack, Plate hook adaptors for GroundGrabba Pro or Pro II or Lag Bolts.